However, we have also had a few instances where the Department has taken 4-5 months or longer to decide and approve straight forward 1 year 155 visa applications. Hence, the Department’s long processing time for your application does not necessarily mean that the Department has any issues with your application. 157 ​​Unavailable due to low volume of applications. ​​Unavailable due to low volume of applications. Applications that do not meet the residence requirement will take longer to finalise than the published processing times advertised above. Processing timeframes for these applications can be up to 12 weeks. You can follow-up with the Department if you want an update in relation to your application. We generally suggest that after you have lodged your visa application, you should wait at least 2 months before following up with the Department for an update if you are applying for either the 1 year or 3 month visas. You can send a follow-up email to the Department (residentsreturn@homeaffairs.gov.au), or you can call the Department. Unfortunately, the Department is unlikely to provide a detailed update in relation to the processing and assessment of your application. Medical records to show that you need to provide urgent care to a family member. Death certificate which demonstrates that you need to travel to attend a funeral. If you were in Australia when you lodged your Resident return visa application, then you can be in or outside of Australia at the time that the Department decides your application. You can travel overseas while your application is being decided, and your visa application can be decided after you leave and while you are outside of Australia. You can apply for Bridging visa A and Bridging visa B while you are in Australia, which are linked to your pending Resident return visa application. If you are granted a Bridging visa B, then this Bridging visa B allows you to leave Australia and return as a Bridging visa B, and wait in Australia until your Resident return visa application. To apply for a Bridging visa B, you must firstly be granted a Bridging visa A, which is why you are lodging applications for both bridging visas. You can lodge your Bridging visa A and Bridging visa B applications at the same time (please see forms for application instructions). The Department’s processing time for these applications is generally around 2-3 weeks. Please note that while you are in Australia as a Bridging visa B, you would be a temporarily visa holder in Australia while you are granted your permanent residency Resident return visa application. A visitor visa holder needs to have the genuine intention to only be in Australia on a temporary basis. Your currently pending permanent residency application indicates that you may want to live in Australia permanently. If you are granted a visitor visa and travel to Australia on this, then the Department’s airport staff may question your travel intentions. If you were outside of Australia when you lodged your 155 visa application, then you also need to be outside of Australia at the time of decision. You may need to re-lodge your application if you enter Australia. You may want to follow-up with the Department instead. If you accidentally return to Australia without a visa after your permanent residency visa has expired (after a brief trip overseas for example), then you will need to speak with the Department’s staff at the airport. They will likely grant you a “entry permit” (Border Visa), which would only be a temporary visa. You can enter Australia and lodge a Resident visa application, and then a Bridging visa A application to allow you to stay in Australia until the Department decides your Resident return visa application. The Department may decide your application based on the information and documents that you have provided, in which case you would just receive either an approval or refusal decision. Hence, it is important to upload all your relevant documents which demonstrate that you satisfy the relevant requirements for the Resident Return visa. The Department may also contact you and inform you that further information and/or documents are required before a decision can be made. The Department’s correspondence will confirm the deadline by which you need to respond. If you are in Australia, then generally speaking, you are given 28 days to provide the requested information and/or documents. Please have particular attention to the date by which you need to respond to any Department request. If you need more time to collect the requested information and/or documents, then you should send a request asking for this extension at least 3-4 working days before the deadline by which you need to respond. Your case officer should grant this extension, which will generally give you another 2-4 weeks to provide the requested information and/or documents. However, whether you are granted an extension is still at the discretion of your case officer, who can deny your request. Once you have collected all the relevant information and documents required in response to the Department’s request checklist, you can upload your new information and documents to your application via your Immiaccount. You can then use the ‘I confirm I have provided information as requested’ link to inform the Department that you have responded to their request. Once you have used this link in your Immiaccount, you do not need to take any further action, send emails or call to inform the Department. If required, we generally suggest preparing your own statement to accompany the information and documents that you upload, in which you should explain to your case officer the ties and/or compelling reasons that you are demonstrating with the information and documents that you are uploading. This should help your case officer understand how and why you satisfy the relevant legal requirements, rather than just leaving it to the case officer to assess and interpret your documents and information. We can assist with preparing a response to a Department request that you have received for further information and/or documents required for your currently pending application. Please see information in relation to our Professional Services. Once the Department has received your response to an earlier Department request, you should receive a decision in around 2-6 weeks (or potentially longer depending on the complexity of your application). However, there is no set timeframe by which the Department needs to make a decision. The Department can certainly take more than 2-6 weeks to make a decision, especially if it is a complicated application. If the Department approves your application, then congratulations! Your new 3 month, 1 year or 5 years visa will replace whatever visa that you were holding (i.e. your new Resident return visa is not added to your current visa). If the Department unfortunately refuses your 155 or 157 visa application, then we may be able to assist with appealing to the Tribunal and/or preparing and lodging a new application with the Department, with updated and new additional documents and information which was previously not provided to the Department. Hi, I hold a RRV 155 visa and it gonna expire in Oct 2019. I now stay permanently in Hong Kong.I want to sponsor my wife and kid to Australia and will lodge an application for 309 visa in HK. Is it possible to get my wife and kid a 309 visa in my case? What happen while waiting for their visa, my 155 visa expire in oct? How big the chance is for my 155 renewal? You need to be a permanent resident when they decide the partner visa. Please see Contact Us page and in relation to our Consultation Service – feel free to contact us if you need advice in relation to your 155 visa options. Hi, i already applied for resident return visa when i was in perth on 04/12/2018. My visa is expired now and im still waiting for approval. My son is due for endoscopy procedure on this coming 21/02/2019 and i need to have the visa approved b4 i can fly on the 19/02/2019. What can i do? Can you please assist me? Please see Contact Us page if you would like assistance in getting the application finalised. I now stay permanently in Malaysia. 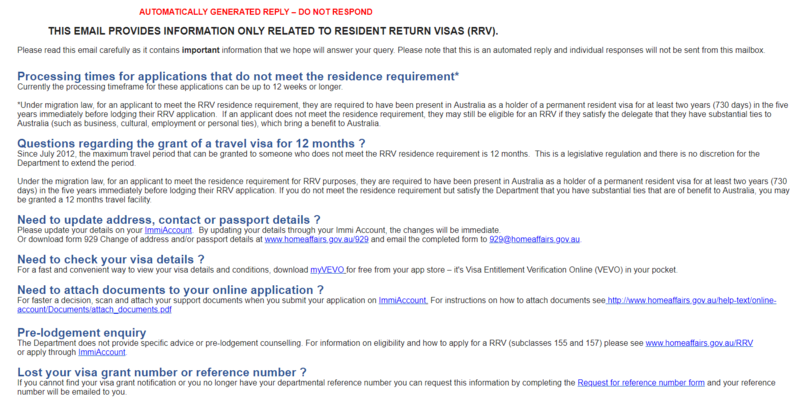 My RRV 155 expiring soon and I have only stayed in Aus for 1 year in the last 5 years. Same condition applied to my husband. We have 2 children holding Aus citizenship certificate. 1) Any advantage if lodge application in Aus VS outside Aus? 2)My husband and I should do group application or separately? 3) we don’t plan to move back until 5 years later, possible to keep renew RRV 1 year until then? You should be eligible for further 155 visas on the basis of having Australian citizen children. Please see Contact Us page in relation to our Consultation Service – feel free to contact us if you need advice in relation to your visa options. You may be able to follow-up with the Department by email – please see above post. Your partner does not need a Bridging Visa if she is in Australia as a Permanent Resident. In case the RRV 155 is refused by the Department then appealing to the Tribunal is refused too, does it mean that PR of that applicant will be cancelled? That would depend on why the Department refused your application. I have applied the RRV application today, will travel overseas in Nov and back by end of Dec and bought ticket. I checked last month it says 5-12 days processing time and though few days for processing but today after applying I realised it says 71 days – 5 months. I got 2 years old baby with me and it is first time my daughter is travelling overseas. Due to possible weather, water and disease breakthrough I never want for baby to live long then 2 months overseas. What should I do now? You can follow-up with the Department if you wish and ask for a decision before you need to travel – please see the above post for more information on following up your visa application with the Department. Could you guide me how can I ask priority processing for my RRV application? I have evidence to support that. Thanks! Today I was granted a 1 year RRV. Im outside of Australia. On what visa can I sponsor my husband and 2 kids so we can arrive together in Australia? Thank you! Hi Peng, I have similar case with Rari of granted 1 year RRV. I prefer for my family to come to Australia on a permanent basis, as I will be sponsor with accommodation and finances obligation. Is there any financial amount that show to the Minister of immigration? There aren’t any specific financial amounts. This will just be one factor and evidence that will be considered for a partner visa application. Hi Peng, I lodged my third RRV application on 29 March 2018 and the status is Received since, have contacted the Australia Embassy in my country and sent emails but no response . My wife and sons are residing in Australia and I need to visit them. How should I go about it? Can I apply for visiting visa to enter Australia? Hi Lew, I am in the same boat as you are! Has your application being processed already? Did you get the result of your RRValready? Hi Peng, my resident return visa is expiring tomorrow and I can’t get back to Australia in time. I have submitted an application and it is still pending. Does it mean I’m not able to go back to Australia at all? I have flights booked for 23rd August. I submitted my RRV on 1 March 2018 and no response until now. My wife and eldest child are PR and we are not staying in Australia ad well. Our youngest child has no PR yet and we plan to apply for her once my RRV is renewed. We are eager to move over to Australia soon as our eldest child will be in Year 1 next year. If we appoint you as our agent for follow-up purpose, would that expedite the whole process? It would be best to contact us if you need consultation and advice in relation to your application. It isn’t really possible to obtain the information/documents that we need, or provide detailed advice via these comment fields which are intended for short/specific queries. I have submitted some additional documents based on the Dept’s request 2 months ago but not yet received any feedback. From your experience, what’s longest waiting time for the result to be released ? Sorry but there isn’t any set processing time – the Department’s general response is that it will take the time necessary to assess all the legal requirements. Hi there! I lodged my Resident return visa application on march the 4th (16 weeks ago) and it still says RECEIVED. No one seems to have looked at my application. Is there anything I can do? I do not meet the residence requirement, but do live with my Australian partner overseas. But what is the reason of the processing change? Hi Alex, has your RRV been approved?